I appreciate a stately, classic rock wall. These manmade puzzles of stone add weight and stability to gardens at Coppertop. 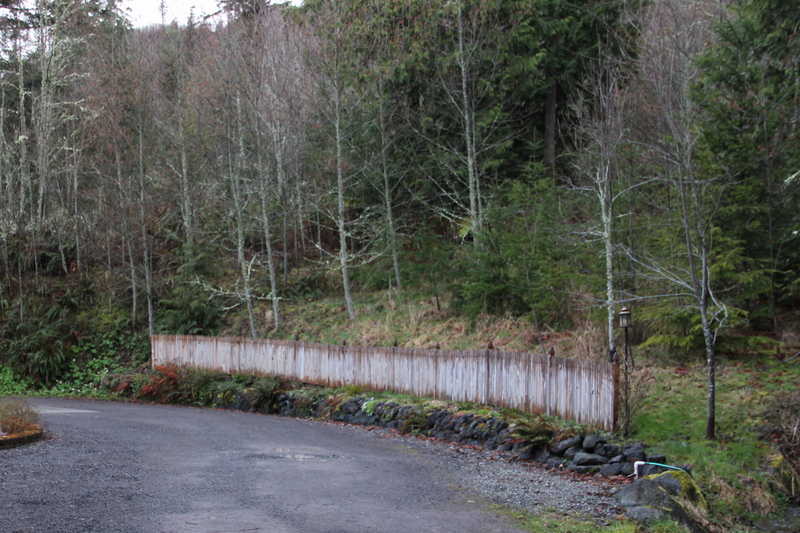 We are fortunate to have two, long rock retaining walls, one along the driveway directly across from the front door, and one on the north side of the house which we cleared about a month ago. 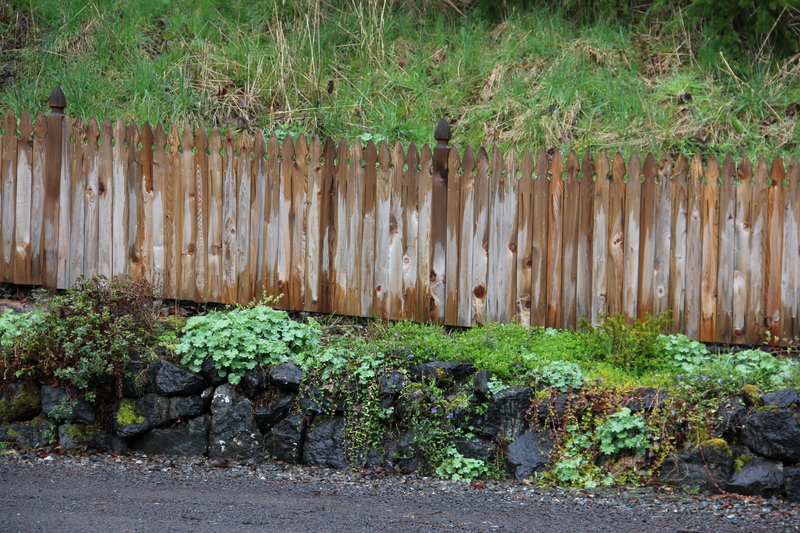 The fence sits directly behind a 3-ft deep border of plants, and other plants grow from crevices in the wall. This section of garden is easy to neglect because we don’t look out on it as often as we enjoy the views toward the water. However, it’s across from the front entry of our home and needs to be a welcoming spot. Yesterday afternoon I began to tackle this area by cutting back large sword ferns, Polystichum munitum. 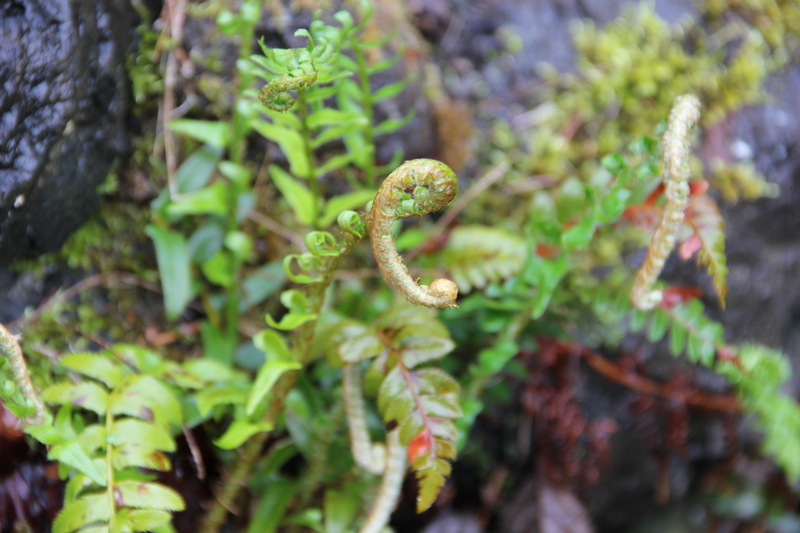 The new fronds in the very center of each fern are just beginning to unfurl, so I carefully cut away all brown, dried fronds. We have hundreds, if not thousands of these sword ferns in the understory of our undeveloped acres, and I will only trim back a few! 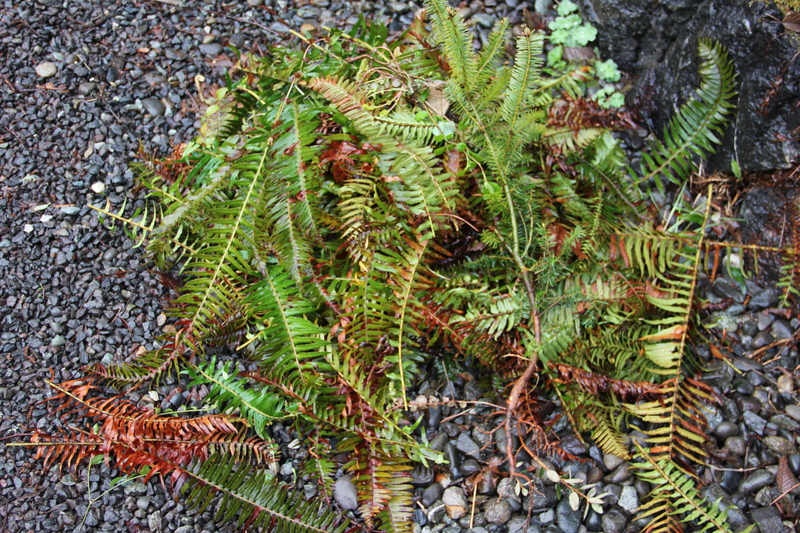 These are classified as evergreen ferns, but in a chilly northern climate, the older fronds can end up looking ragged, so I’ll prune a few ferns that are suffocating other plants or are in prominent locations where their old brown fronds stand out. 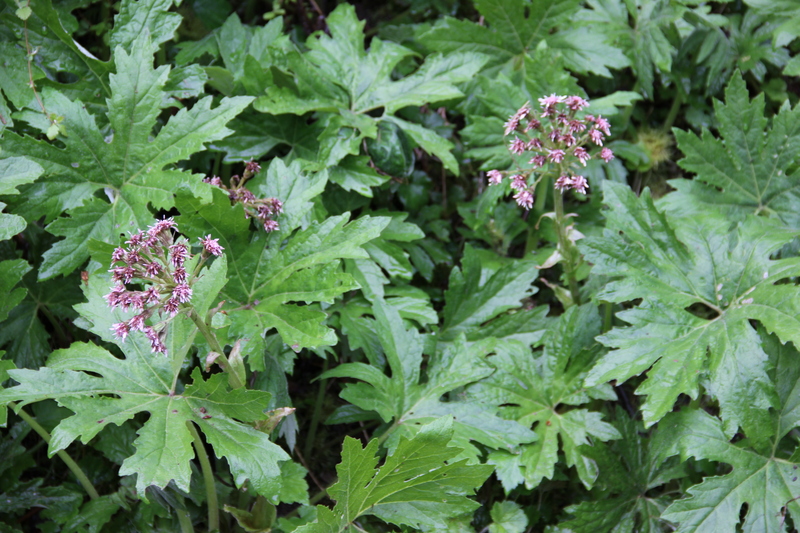 Plants I recognize atop the wall: sword ferns, coral bells, lady’s mantle, low-growing evergreen conifers, sedum, azaleas, forget-me-nots, and ground covers including golden creeping jenny, candytuft, vinca/periwinkle, rock cress and others I can’t name. This part of garden care is some of the messiest, and since the day was a drippy one, getting muddy was inevitable. Good thing we love rain! 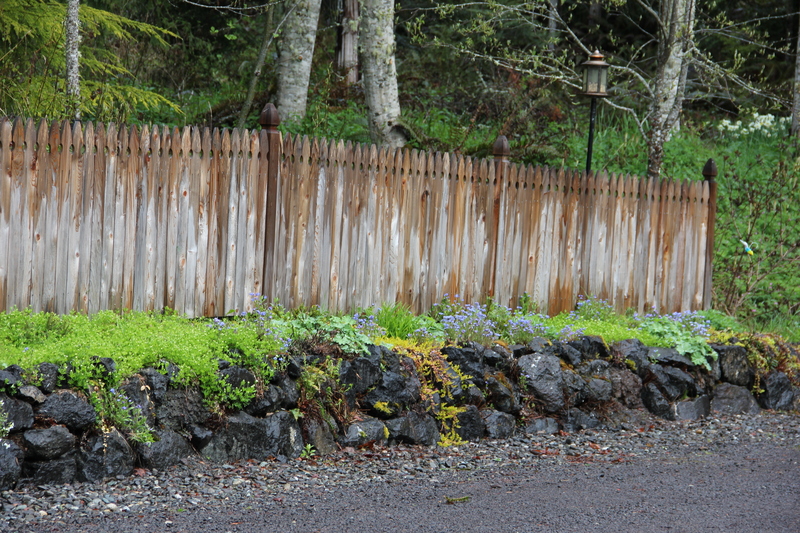 This entry was tagged Coppertop, gardening, Olympic Peninsula, petasites palmatus, rock wall, stone wall, sword ferns. Bookmark the permalink.